If you were really serious about your NES gaming back in the day then there was only one control option in town: the NES Advantage. An arcade-style joystick so sturdy it felt like it could comfortably withstand nuclear war, it even had a brush with Hollywood fame thanks to the movie Ghostbusters 2. This iconic peripheral is getting a fitting tribute in the form of EMiO's "The Edge" controller, compatible with the forthcoming NES Classic Mini. It's a pretty faithful replica of the real deal, right down to the Turbo and Slow-motion buttons. It will cost $24.99. + Turbo functions allow repeated button presses by holding the "Turbo" button. The Turbo knobs control the speed of the buttons, and the ON/OFF buttons activate the turbo function on A and/or B buttons. + Joystick is a digital 8-way input with circular gate. Switch between the ball top and bat top joysticks (incl.). Brings the arcade feel home, and works specially well with games that use 8 directions. + A and B are micro switches with higher end and long-lasting material. These buttons are the best choice for any fighting game enthusiast! + The Edge Joystick includes "Slow" & "B+A" buttons. "Slow" button gives an edge over a normal controller by making the game go in slow motion. Easily and accurately execute "B+A" moves. + Edge Joystick comes with a 9' cable, so you can play your favorite games from almost any spot in your room! You don't have to worry about pulling the cable and disconnecting in the middle of a game. 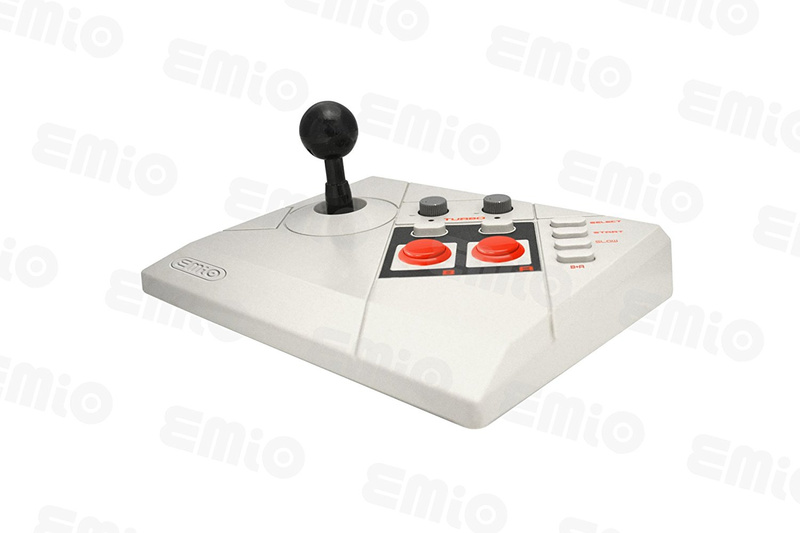 EMiO is also releasing a joypad with Turbo support for $14.99. 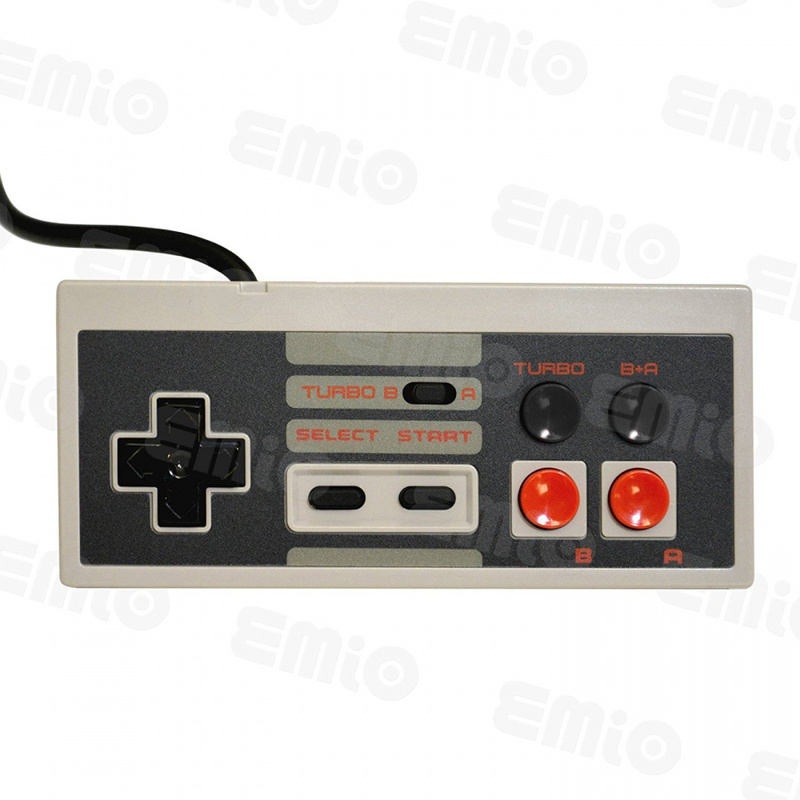 + The Turbo functions allow repeated button presses by holding the "Turbo" button. The turbo switch activates the turbo function on either A or B. + The Turbo function will give an edge over those using a normal controller by increasing button pressing speed significantly. + Edge Gamepad comes with a 9' cable, so you can play your favorite games from almost any spot in your room! You don't have to worry about pulling the cable and disconnecting in the middle of a game. + The Edge Gamepad includes the "B+A" button, making it easier to execute certain moves requiring the player to press both the A button and the B button. Execute "B+A" moves with more accuracy. Given how quickly the official NES Classic Mini pads are likely to sell out, are either of these options tempting to you? Or do you insist on only buying first-party controllers? Though I might be in the minority here, I'm not interested in the new mini.if Nintendo came out with a Snes mini, then I would buy. Unusual? Impractical to store? It will be mine. Didn't own the Advantage, but I'll definitely take any controller that doesn't require an extension cable, especially since I can't find one that's compatible with the NES Classic Controller. I like it, but the B and A buttons are wrong. Close, though, and the price is very nice. Won't this also work with a Wii/Wii U? Via the Wii-controller. @BF-Medic if it works with the NES Classic Mini, then there's no reason that it shouldn't work with a Wiimote as well, so the answer is probably yes. I had one of the originals. Sigh I may have to get this thing after all. Let me find my tent to camp out. That is pretty cool! However the original Advantage was pretty spongey & cheap (as were most "arcade" home sticks at the time) rather than proper micro switched joysticks like in a real arcade cab. I guess that this will be the same, as they mentioned micro switches for the buttons, but not the stick? I had an Advantage growing up. The stick was great, the buttons poor. The turbo function made a mockery of Track & Field. Man it made that javelin fly! Circular gate? Microswitch buttons? I seriously doubt they crammed a Sanwa stick in there given it's low profile and lower price. Call me intrigued though. But the A+B function is just useless IMO, and the joypad not having turbo for both buttons is an oversight. Since the pad has four buttons anyway, they should have simply forgone the turbo switch and placed BB and AA above the primary buttons. i had one of these!!!! that's all. just wanted to say it. @AlexOlney i like the way you think, olney. @TruenoGT Ahh see, NOW we're talking! I had one of the originals. I was super excited when I first got it but I stopped using it in favor of the original NES controller. I'll give it credit, it definitely was built tough, but the response wasn't as good as the original controller in my opinion. The Advantage was great for Punch Out, but too big and awkward for platformers. The NES Mini was going to be a day one purchase for me, until I saw the length of the controller cable. Really put me off. Do we know that it actually works on the NES mini? Wish someone would modify a regular length cord for the controller. Someone needs to make an adapter so you can use the original. They're fairly cheap ($10-15 around here). I was hoping someone would do this. I still have my NES Advantage and it is nice to have for games, especially Blaster Master. I still don't know if I'll be getting the mini NES, but this accessory might sway me to. I have the original I picked up on Ebay with box a little over 10 years back. This is very cool. If they do a dogbone controller with turbo controls I am totally sold! I never cared for turbo buttons but this is cool. I have one of these that I use all the time on my NT and original Nintendos. Given the low price, I highly doubt it'll be the same, super heavy, controller. Now can we see an NES MAX joystick?! Ha, yes...playing T&F with the turbo buttons. Always a hoot! Like doing the olympics on steroid!!! Unless of cause it was the USA one... excuse me I need to vomit. True I forgot about that bro lol. Yeah unfortunately we got stuck with the ugly design.. I didn't know about the other designs until years later.